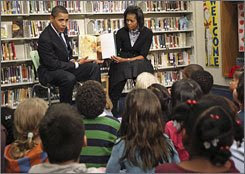 President Obama and first lady Michelle Obama read The Moon Over Star to second-graders at Washington, D.C.'s Capital City Public Charter School in February. WASHINGTON — President Obama and first lady Michelle Obama will preside over the ninth National Book Festival, a day-long celebration of the joys of reading and literacy, scheduled for Saturday, Sept. 26, on the National Mall. "The National Book Festival has become a true American institution," said James Billington, the librarian of Congress. "It is a joyous and very popular celebration of books and reading in the Washington, D.C., area." The Library of Congress organizes and sponsors the event, which is free and open to the public. An estimated 120,000 people have attended each of the past two festivals, a library spokeswoman said. Former first lady Laura Bush, a retired teacher and public school librarian, started the festival in 2001, modeling it after events she held as first lady of Texas.